Please refer to our stock # R356 when inquiring. 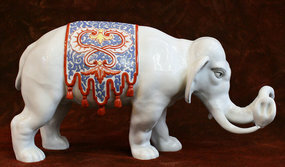 This is a rare, well-modeled and detailed 19th Century Japanese Arita Porcelain Elephant. It is based upon an outstanding 1680 Japanese Kakiemon model, which in turn, was derived from Chinese prototypes. This piece is enameled in red and cobalt with yellow accents. It is a beautiful and striking work of art. Width: 17 inches (43cm); Height: 8.25 inches (21cm).